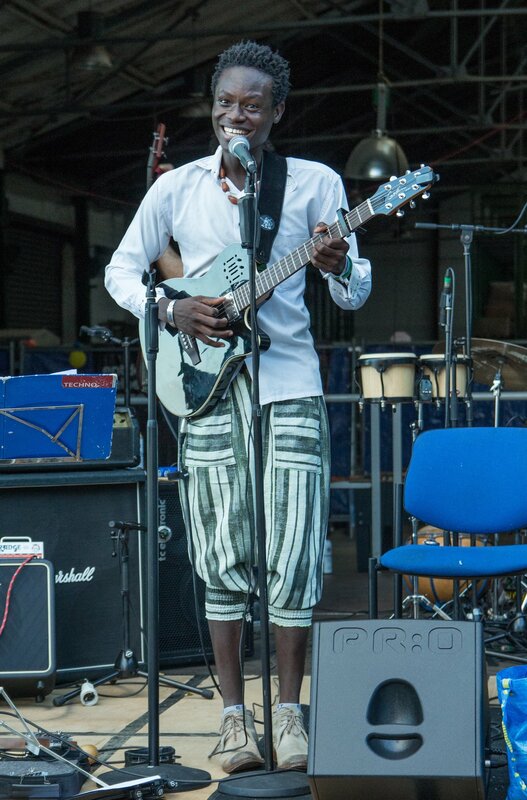 Ezé Wendtoin, a prominent West African musician will visit OSU Campus March 19-27. He has dedicated his work as a musician to increase understanding of different cultures in Germany. As a solo artist and together with the Dresden musician collective “Banda Internationale” he has stood against racism and xenophobia through music in concerts, theater, social projects, and in his work as an educator and scholar of German Second Language Acquisition. At the Ohio State, he will offer concerts, conversations and lectures to engage with our local students, artists and community. Find below the events open to the public which we encourage you to attend. In this workshop, Ezé uses music invites students of German and French to develop ways to think about and bring together different understandings of culture and living. He will incorporate your perspectives to encourage a learning environment in which you are able to learn with and from each other. Ezé will talk about his work with different non-profit organizations and collectives (Atticus e.V., Lauter Leise in Sachsen, Banda Internationale). He will also present his visits to local schools in Germany, during which he talked with students about issues of racism, prejudice, and clichés, telling the students about how he has made his way to Germany, and what role music played for his journey. He will talk about Burkina Faso by presenting different photographic materials. The workshop is open to students of German and French. There is no minimum proficiency level required. Students of different proficiency-levels are encouraged to participate. Each workshop holds 20 students. Join us for the plenary panel that will open the Midwest Slavic Conference on Saturday, March 24, 8:30-10:30am. The plenary panel is free and open to the public. “Borders, Barriers, and Belonging: A Spotlight on Global Migration,” will host five interdisciplinary migration scholars to engage in a discussion that weaves together regional and global perspectives in historical and contemporary human mobility. 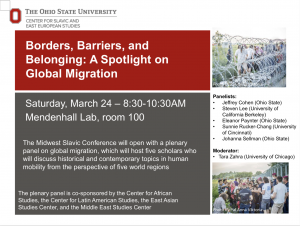 The panelists include Jeffrey Cohen (Ohio State), Steven Lee (UC Berkeley), Eleanor Paynter (Ohio State), Johanna Sellman (Ohio State), and Sunnie Rucker-Chang (University of Cincinnati). Tara Zahra will serve as the panel discussant. 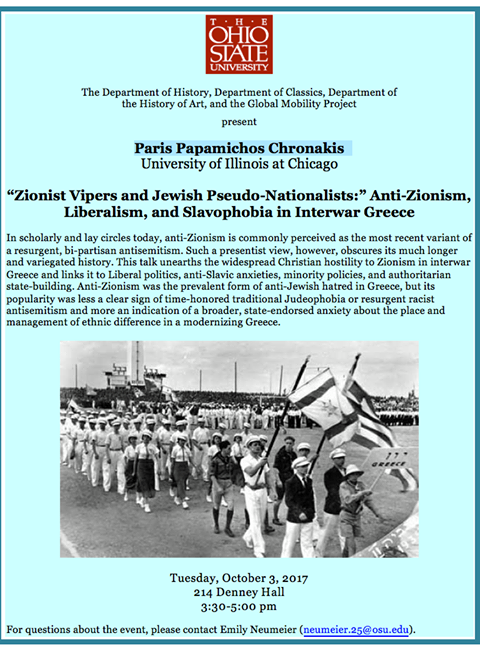 The panel is organized by the Center for Slavic and East European Studies and co-sponsored by the Center for African Studies, the Center for Latin American Studies, East Asian Studies Center, and the Middle East Studies Center. 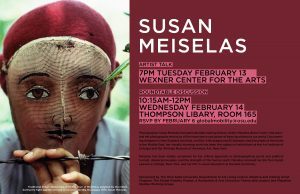 Susan Meiselas, born in Baltimore, Maryland in 1948, received her BA from Sarah Lawrence College and her MA in visual education from Harvard University. Her first major photographic essay focused on the lives of women doing striptease at New England country fairs, whom she photographed during three consecutive summers while teaching photography in New York public schools. Carnival Strippers was originally published in 1976 and a selection was installed at the Whitney Museum of Art in June 2000. Meiselas joined Magnum Photos in 1976 and has worked as a freelance photographer since then. She is best known for her coverage of the insurrection in Nicaragua and her documentation of human rights issues in Latin America. She published her second monograph, Nicaragua, in 1981. Meiselas served as an editor and contributor to the book El Salvador: The Work of Thirty Photographers and edited Chile from Within featuring work by photographers living under the Pinochet regime. She has co-directed two films, Living at Risk: The Story of a Nicaraguan Family and Pictures from a Revolution with Richard P. Rogers and Alfred Guzzetti. In 1997, she completed a six-year project curating a hundred-year photographic history of Kurdistan, integrating her own work into the book Kurdistan: In the Shadow of History and developed akaKurdistan, an online site of exchange for collective memory in 1998. Her monograph Pandora’s Box explores a New York S & M club, has been exhibited both at home and abroad. Encounters with the Dani reveals a sixty-year history of outsiders’ discovery and interactions with the Dani, an indigenous people of the highlands of Papua in Indonesia. Meiselas has had one-woman exhibitions in Paris, Madrid, Amsterdam, London, Los Angeles, Chicago, and New York, and her work is included in collections around the world. She has received the Robert Capa Gold Medal for her work in Nicaragua (1979); the Leica Award for Excellence (1982); the Engelhard Award from the Institute of Contemporary Art (1985); the Hasselblad Foundation Photography prize (1994); the Cornell Capa Infinity Award (2005) and most recently was awarded the Harvard Arts Medal (2011). In 1992, she was named a MacArthur Fellow. 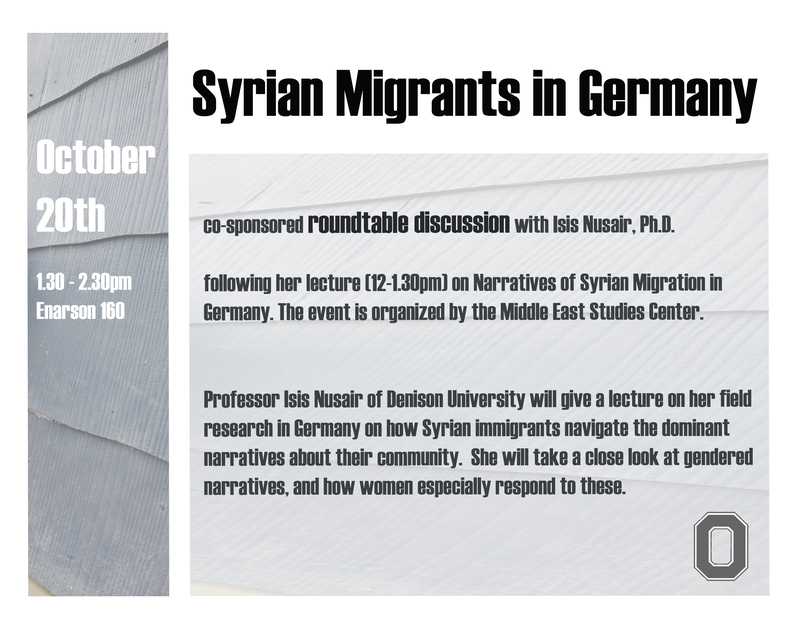 The Middle East Studies Center will host Professor Isis Nusair (Denison University), who will lecture on her field research in Germany on how Syrian immigrants navigate the dominant narratives about their community. She will take a close look at gendered narratives, and how women especially respond to these. For more information, please go to MESC Events Calendar. Following the lecture, there will be a roundtable discussion with graduate students. Please note this event co-sponsored by the Global Mobility Project, together with the Departments of History, Classics, and History of Art. Join the Center for Slavic and East European Studies for a bilingual discussion about current migration policy within the Russian Federation. 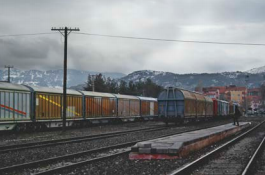 Since the collapse of the Soviet Union, Russia has seen 25 years of migration flows as populations have adjusted to new state boundaries in the region, the aftermath of forced resettlement of populations during the Soviet Union, and the economic migration of populations from neighboring countries to work in Russia. With increased attention on migrants and immigration in countries across the world, this talk will focus on the flows of people within the Russian Federation, their causes and effects, and government and policy responses. Sergei Abashin, a professor of anthropology at the European University at St. Petersburg, is a specialist in migration studies and Central Asian nationality building who has done extensive field work in Uzbekistan, Tajikistan, and Kyrgyzstan. The talk will be delivered in Russian, with simultaneous English translation. Students of Russian, as well as faculty and the general public who are interested in the topic but do not know Russian are encouraged to attend. Watch a recording of the Facebook Livestream below. Please join Literacy Studies, co-sponsored by Rhetoric, Composition, and Literacy and Latino/a Studies in observance of Cesar Chavez Day, this Thursday for this lecture engaging ideas of migration and literacy learning. Thursday, March 30, 2017 – 4:00 p.m. According to the UN, 244 million people currently live outside the countries of their birth. As more people worldwide migrate to find work, policy makers have expressed concerns about the effects on family dynamics and an international “brain drain.” Vieira’s ethnographic research reveals migration’s unexpected relationship to literacy learning as transnational families write to stay economically and intimately connected. 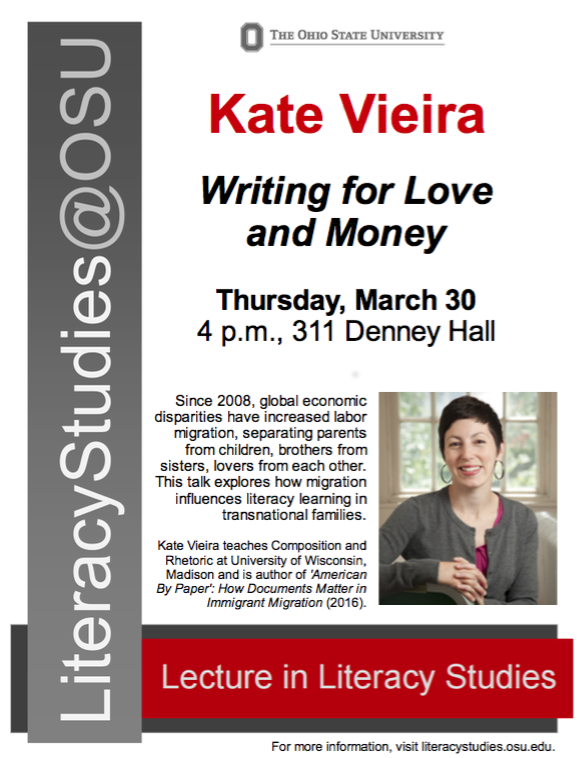 Kate Vieira teaches Composition and Rhetoric at University of Wisconsin, Madison and is author of ‘American By Paper’: How Documents Matter in Immigrant Migration (2016). Contact Michael Harwick (harwick.1@osu.edu) or Nora McCook (mccook.3@osu.edu) with any questions. 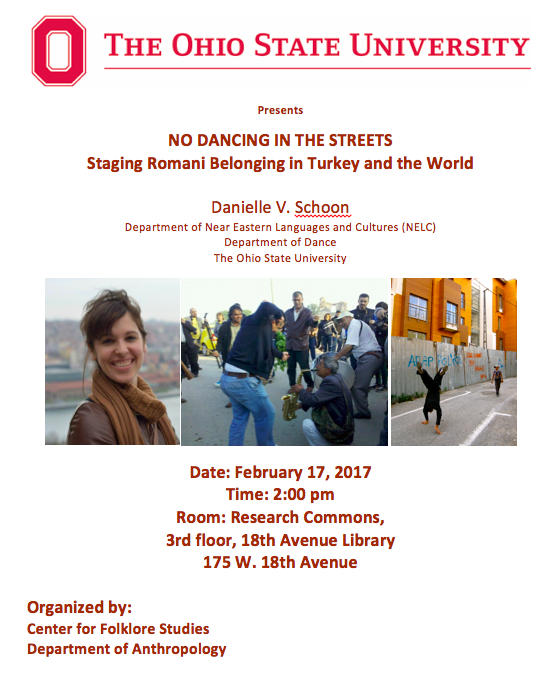 This lecture by Global Mobility Project affiliate member Danielle V. Schoon might be of interest for those who are interested in dance, performance, migration, or the Romani. This talk presents research that examines Romani (“Gypsy”) identity in Turkey in light of conflicting claims to belonging in the city, the nation, the European Union, and the “global village.” While Turkey’s Roma are being actively integrated into minority politics, they are also facing the dissolution of their communities, traditional occupations, and cultural life as privatization and land reforms dislocate the urban poor to state housing units in the name of improvement and ‘renewal.’ At the same time, international rights organizations are supporting counter-hegemonic state narratives via minority and human rights discourses that both enable and limit the boundaries of Romani identity. The talk will compare three cases that locate the intersection of urban space, state-led reforms, and Romani belonging in dance practice: 1) competing Hidrellez events that strategically place dance on the street or on the stage; 2) dance classes for dislocated Romani children that codify and stage social dance as a folk dance; and 3) Romani performers who travel the global belly dance circuit. This talk may be of interest to those who study migration and mobility. 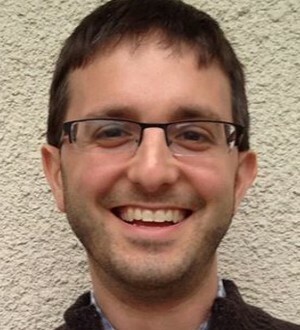 This talk by affiliate member Isaac Weiner might be of interest. What does religion in central Ohio sound like? Where does one go to hear it? How might we understand religious diversity differently if we begin by listening for it? These questions animate the American Religious Sounds Project (ARSP), a collaborative research initiative of Ohio State and Michigan State Universities, which will offer new resources for documenting and interpreting the diversity of American religious life by attending to its varied sonic cultures. In this talk, Professor Weiner will introduce the ARSP and reflect on some of its opportunities and challenges.